It’s time to face the facts. Our industry and category management have been evolving for awhile (decades, actually). And, although change can be hard to overcome, attendance at our live webinars last week for both Retail and Manufacturing organizations, as well as Solutions Providers confirm that awareness of the changes ahead is growing — and concerning to both practitioners and leaders alike. As a category management practitioner, you need to learn more advanced thinking to stay relevant and compete, and learn ways to make better decisions and recommendations in your role for Shopper-focused solutions. As a leader in your organization, or someone who can influence change, you need to take it one step further and not only identify the priorities for your organization, but figure out how you’re going to get there. Why are the changes to the category management process necessary, and what are the implications for you, your customers, and your organization? How can you develop better foundations (as a Retailer or Manufacturer) for a more strategic, Shopper-focused, aligned approach to category management? 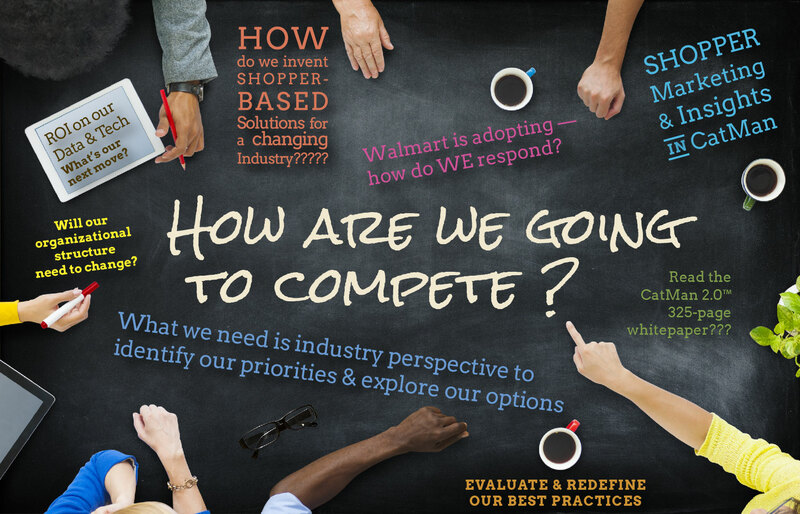 How can you better reflect Shopper in your foundations for improved fundamentals? What are the best-in-class processes and approaches across categories? business development teams? departments? Can you answer WHY your Shopper buys? How can you advance the assessments, reviews and analytics in category management? What areas are most important for you and your organization based on the level of sophistication in your organization, your access to data, and your relationship with your external partners? Are you spending too much time or resources for too little Shopper results? How do you move to more advanced approaches across the tactics to better reflect Shopper and more complex data sources? What are the anticipated changes in each of these tactics in the future and how can you reflect them in your work? your organization? How do changes in category management affect the design and development for your organization? for your customers? What needs to change on your team? in your organization? How can you move ahead towards internal alignment? What are the roadblocks? the opportunities? How can you increase collaboration with your external business partners? What is the VALUE, or ROI, of category management work? What are the biggest challenges in deployment and supply chain that should be considered in category management? How well are you doing at this critical step? How do the recommendations or decisions you make affect the supply chain and where are the opportunities? What are the most effective and efficient ways to ensure compliance and implementation of our plans? Be proactive and educate yourself, your team and your organization on how to master advanced category management. Learn how you can make changes at your desk or in your day-to-day and long-term role as a leader or practitioner. CatMan Master's Training options were announced as part of our webinars with **introductory pricing through December 13th** on category management training Courses Series and Program for Retailers, Manufacturers, and Solution Providers. Purchase details are in the webinars.